I’m sure I don’t have to remind you all that Christmas is very quickly approaching and I really hope that your Christmas shopping is well underway by now as before you know it, there wont be much time left! 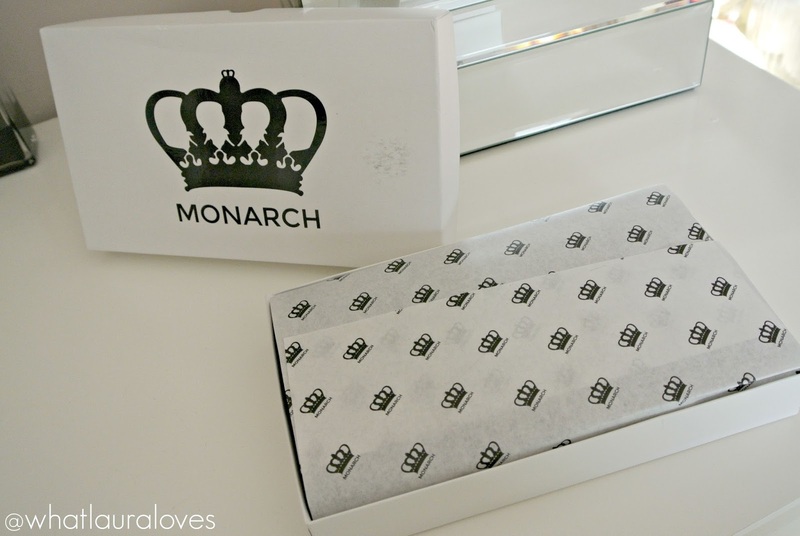 Today, I have another gift idea for you and its from Canadian leather accessory brand, Monarch. Monarch Leather have a whole range of products that would be make ideal Christmas gifts whether you’re buying for a man or a woman. For men, they have a gorgeous range of wallets in so many different styles and sizes. I find that wallets with plenty of card slots are so important these days as we all seem to spend on our cards far more than we pay in cash. Plus theres a store card for absolutely everything now. My hubby is a bit of a sucker for points cards and he’s trying to get my interested in them so has given me lots of the little ones that go on my keys. I currently have one for Waitrose, Tesco, my beautician, our hair dresser and the dry cleaners. There’s no doubt in my mind that by this time next year, I’ll have several more of these to tell you about! 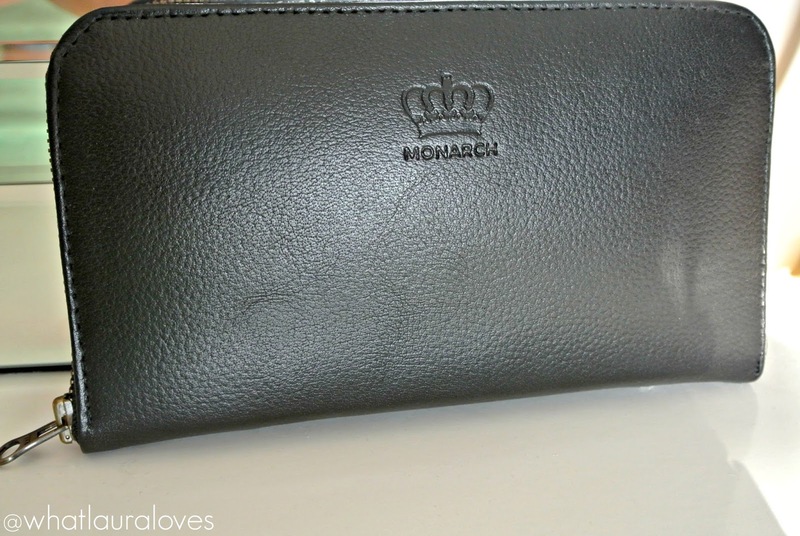 I really like the Monarch mens wallets that are in the two tone leather as I think they really stand out and the pop of colour on the inside adds a little extra interest. So if you’re looking to buy for a man this Christmas then that’s what I would suggest. With regards to gifts for women, Monarch have a big selection from wallets to handbags and clutch wallets. They sent me over one of the latter and I love how great quality it is. The Accordion Clutch Wallet is a great piece for a woman on the go who likes to be able to grab her purse and have everything that she needs already inside. It is very functional but fashionable too as it is could easily be used as a clutch for a meal out at night if you’re not someone who likes to carry too much with you. 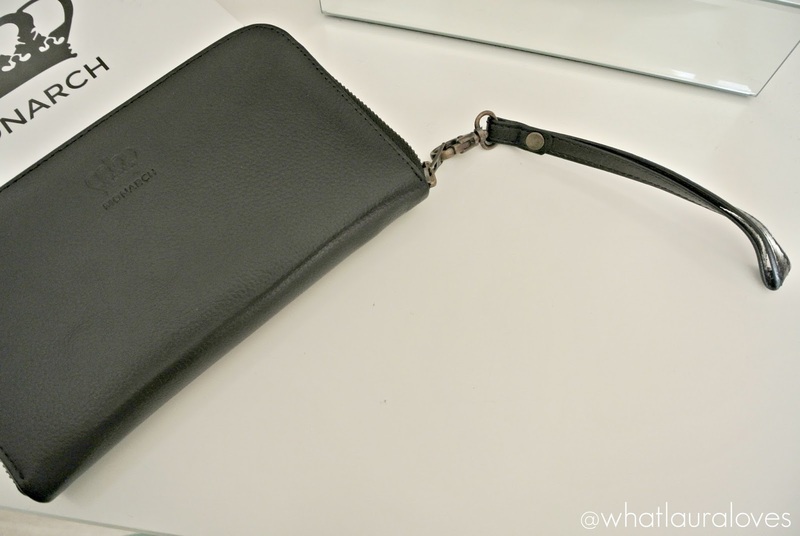 It has a detachable hand strap as well as a strap that is secured across the back of the wallet that you can put your hand through so that it is easy to hold. It is quite wide and very sturdy, with a solid zip to open it. There’s no questioning that this wallet is very well made. Inside it is an organisers dream. There are 12 card slots for all of your credit, debit and store cards, 5 multifunction pockets which are ideal for receipts, gift cards and notes, a zipped coin compartment and a padded smart phone compartment so you can slip your mobile inside and know that it is going to be protected should you be less than careful with your wallet. 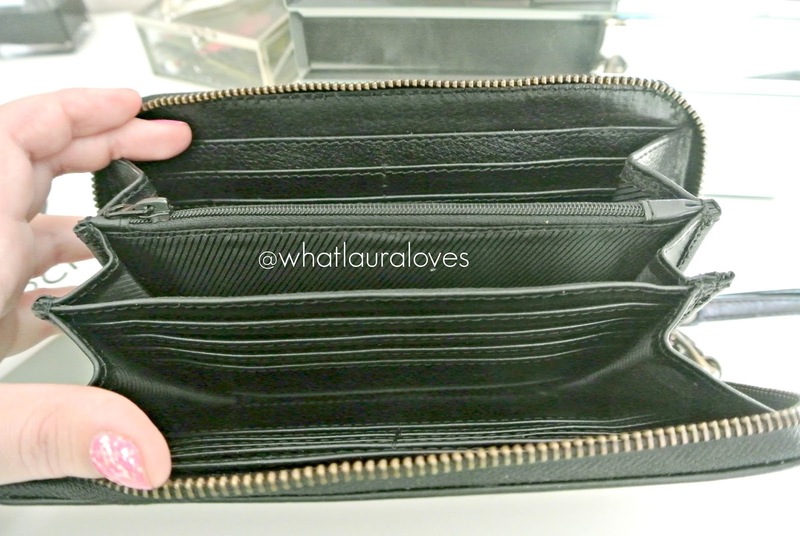 I love that my phone can fit inside here as it makes this wallet a great piece that I can take out with me on a night as all I need to pop inside are my cards, my phone and my key which all fit perfectly well as they don’t take up too much room. This particular accordion clutch wallet is in the ebony grain leather which is absolutely stunning. The grain of this leather actually reminds me of my new handbag which I’m sure you’ll have heard me talking about over on my youtube channel. The wallet doesn’t have any major branding on it. There is a logo on the front face that is embossed into it but it is quite subtle. If you’re looking for a gift for the lady in your life then I’d recommend checking out the range at Monarch. I think this wallet in particular would be great for a mother on the go. She could keep her phone and money essentials in here and then just grab it out of her bag if she needed to pop into a shop, etc rather than having to carry her whole bag with her if it is full of lots of things and heavy to carry. To purchase the Accordion Clutch Wallet or any of the other leather goods from Monarch, head on over to their website here. This is beautiful. I love that it has a easy strap too. What a great gift!!! I like how this is handy for everything and it has a useful strap to hold on to it too. I love a purse that has lots of compartments! this is great. very classy!